The Hambach Building, built in 1913, forms part of an ensemble of buildings, aligned along First Avenue South, from Jackson Street to King Street, all designed as warehouse buildings. The Schwabacher Hardware Company Building by Bebb and Mendel of 1903-05 on the corner of Jackson and First Avenue and the Seller Building of 1906 by A. Warren Gould are the two others. So far, the architect of the Hambach Building is a mystery. All the buildings are clearly influenced by the Chicago School and as a result, are stylistically tied together. The Hambach was obviously designed to fit in with the other two, but, in fact, its exterior has a more clearly defined base, middle and top, with repeated recessed vertical bays. Previous studies, by Victor Steinbrueck and Elizabeth Brians, for instance, have commended the building for fitting in with the others, but have described it as “undistinguished;” but particularly as a utilitarian warehouse building, its overall design seems to be greater than the sum of its parts. With a simple, repeated bay, a well defined base and seemingly lighter top level, it is striking in its own right. It is also structurally more advanced than the other two buildings. The Schwabacher Hardware Company Building, remarkable because of its exterior design and Sullivanesque ornament, has the most traditional structure, while the Seller Building had absorbed more cutting edge aspects of construction (for its time), but was not quite up to the level of the Hambach Building. The Hambach Building was designed for Albert Hambach, a successful wholesale dealer in steam and plumbing supplies. He had owned property or commissioned buildings in the former “burnt district” since 1898 and is listed at an address on Western Avenue local directories in 1898. In 1905, a warehouse building designed by Josenhans and Allan at 212 Second Avenue/313 Second Avenue Extension, between 2nd Avenue and 2nd Avenue Extension was also built for Hambach. Hambach also commissioned the 1907 Westland Building (one of its former names was the “Hambaca Building”) across the street at 100 S. King Street. In 1983, the R.D. Merrill Company applied for and obtained historic certification for four buildings, the Schwabacher Hardware Company Building, the M. Seller Building (1906), the Hambach Building of 1913 and the Schwabacher Warehouse Annex (1909), located behind the Schwabacher Hardware Company Building. These four buildings now form the core of Merrill Place, a rehabilitation completed by Olson/Walker Architects and NBBJ in 1985. 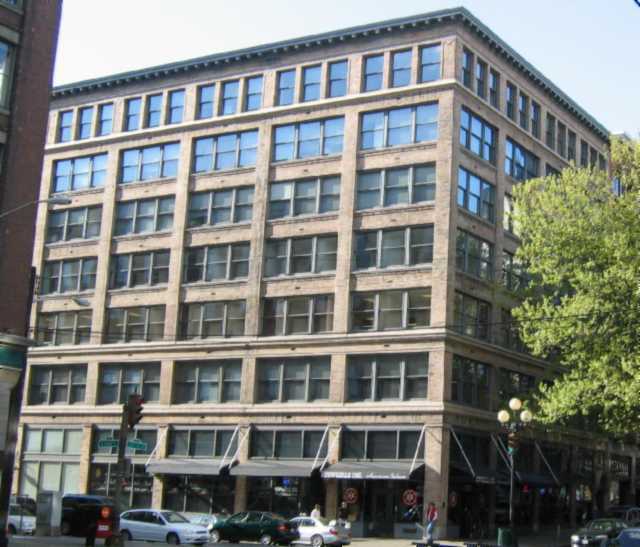 The Hambach Building, which dates from 1913, is rectangular in plan, 78 by 119 feet, with the narrower and main elevation on First Avenue South. The other street elevation faces south on King Street. The building is seven stories in height with a parapet and cornice. Its structure is somewhat advanced for its time. The structure is entirely of reinforced concrete and consists of two-way concrete slab with coffered bays and concrete columns. The skin of the Hambach building is a veneer of light colored brick on First Avenue South and on King Street and clay block covered with stucco on the rear elevation. The First Avenue South façade is divided into four bays and the King Street elevation into six bays. The design of the exterior facades is based on the notion of a well-defined base, middle and top, as seen in many buildings of the Chicago School. The “base” consists of a ground floor with clerestory, topped by a belt-course, with a second level topped again by a belt-course. This gives the Hambach building a really generous base as well as a sense of solidity. The “middle” consists of the next four floors, again topped by a belt-course. The top consists of trios of single double hung windows topped by a classical cornice. Below the “top” level, bays consist of three linked double-hung windows at each level. From the second level to the fifth level, the bays, which are recessed, are the same, although they are narrower on the First Avenue South elevation. The floors of the Hambach building were designed to align with those of the adjacent Seller Building. 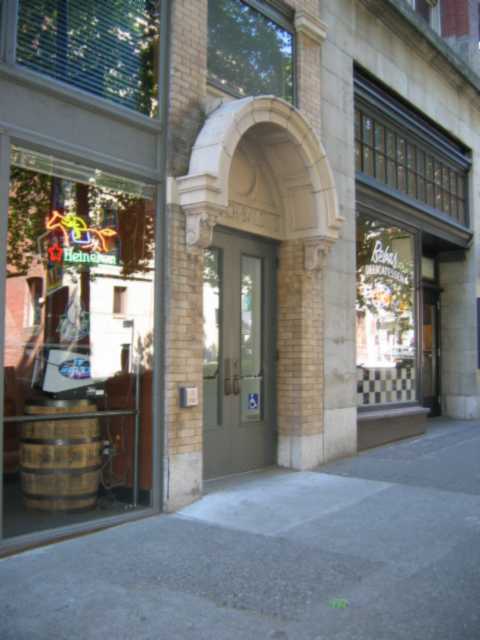 A narrow, arched entrance, ornamented in terra cotta, occurs at the fourth bay (counting from King Street), and contrasts somewhat with the simple, clean lines of the rest of the building. The building was restored as part of the R. D. Merrill Complex, which includes the Seller and the Schwabacher Hardware Company buildings, in 1985. Brians, Ann Elizabeth. Indomitable Pioneer Square. Master of Urban Planning Thesis, University of Washington, Seattle, 1973. R. D. Merrill Company. “Merrill Place, Historic Preservation Certification, Part 1,” 18 May 1983. OAHP, State of Washington, Olympia, Washington, Microfiche File.